At the ECA(SA)’s 2017 Presidential Excellence Awards, Brand Engineering and its two empowerment companies, Besamandla (W.Cape) and Besamandla (E.Cape) were the finalists in six categories and won five of those categories: Installation of the Year (Industrial), Installation of the Year (Office Blocks); Reticulation Contractor of the Year; Best Contributor to Renewable Energy; and Installation of the Year (Hospitals). Brand Engineering SA (Pty) Ltd, a member of Brand Engineering Holdings, has been operating for more than 45 years in the construction and manufacturing sectors. It carries out electrical, instrumentation and automation installations for commercial, industrial, infrastructure, mining, marine and renewable energy projects (solar and wind), not only in Southern Africa, but on the African continent as a whole; where strong partnerships with local companies have been formed. All the winning entries will be showcased in SA Electrical Contractor to honour the winners and to also inspire our members and motivate them to enter their best projects this year. Edison Power’s winning entries in the categories Special Innovative Project and National Safety Award will be featured in the next issue, coming up in August. The scope of work was to undertake the Electrical, Control & Instrumentation installation for the Elandsfontein Processing Plant, including the receipt and handling of free-issue cable, luminaires, transformers, instruments and motor control centre panels. Once the steel installation was completed; Brand undertook the full electrical installation comprising of electrical and instrumentation works. Electrical included all reticulation via trenches or cable trays, full earthing system for plant structures, installation of transformers and installation of MCCs with all ancillaries. Under the MV works, Brand undertook the placement of transformers, laying of MV cables into trenches (along with fibre optic cabling), mechanical protection of cables, backfilling of trenches, terminating of MV cables as well as the testing and commissioning of the transformers, which were supplied and free issued by Actom. Earthing: A full earthing scope was executed in accordance with the design. This comprised 280 x 1.8 m earth rods to be driven into the platform. 70 mm² bare copper earth was placed into earthing trenches and CAD welded to earth rods. A tee-off CAD weld was made on the earth ring wherever a structure needed an earthing tail. This tail would be of 70 mm² PVC insulated copper. Cabling: MV cabling was generally underground with LV cables to devices and sub-DBs traversing the cable ladders. Instrumentation & Control: Instrumentation included the handling and installation of instruments with an instrument count of 929 devices and an ASi node count of 1 113. The ASi (Actuator Sensor Interface) system was employed, which allows for easy installation of nodes via insulation piercing contacts. The scope also included the supply and installation of air manifolds, Dekabon air tubing in 8 mm and 12 mm gauge, as well as all the T-pieces and connectors required for installation. Manifolds connected via flexible hoses to main air lines installed by others. Main air system fed by six compressors and accumulator tank. The manifolds required had to be specially made from stainless steel and an additional cost was authorised for this. Supply and installation of 11 kV MV switchgear. Supply and installation of 630kVA transformer. Supply and commissioning of 30kVA UPS. All LV cable reticulation to sub DBs. Supply and installation of all trunking, cable ladders and wire ways. Supply and installation of all luminaires as per suppliers’ requirements. Supply and installation for the complete lightning protection installation. Supply and installation of all electronic services including fire detection, CCTV, access control. Supply of all LV distribution boards including HVAC DBs and connection of all HVAC equipment. The office sections with an auditorium, offices, bathrooms, laboratories and canteen facilities. The Warehouse section which included test cells which will be used for the testing of tyres, rims etc. 120 kW PV installation on the roof consisting of three inverters, solar log, weather station and 383 PV panels. The complete electrical installation had to comply with Green Star SA requirements. The majority of all the light fittings were LED fittings with Dali control to enable the light system to be controlled via the BMS system. A 120 kV PV installation was installed on the roof, and this feeds back into the grid. 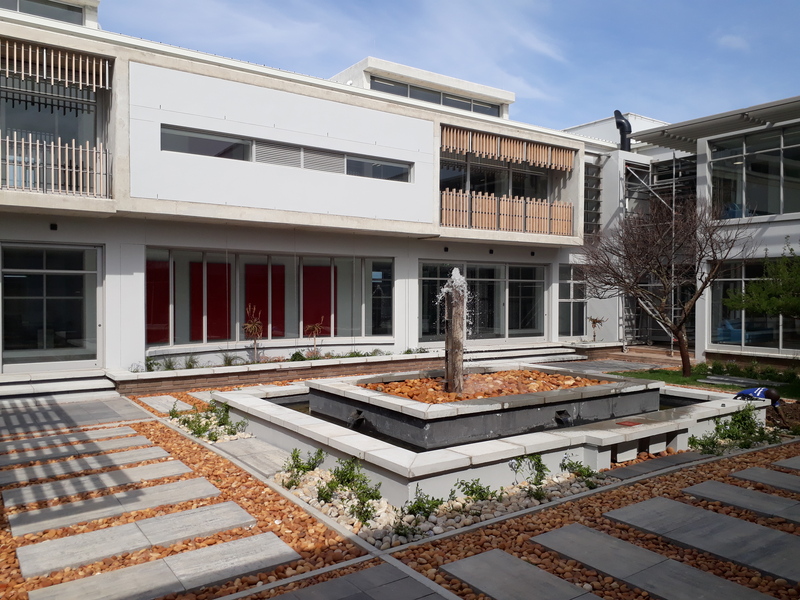 The building is one of seven building in South Africa to receive a 6 Green Star grading for design. A new introduction to the industry was the supply and installation of three car charging stations to meet the Green star requirements for this project. Name of project: Ilanga CSP Project: Execution of trenches at the solar field (including pulling and laying cables), in Upington, Northern Cape. 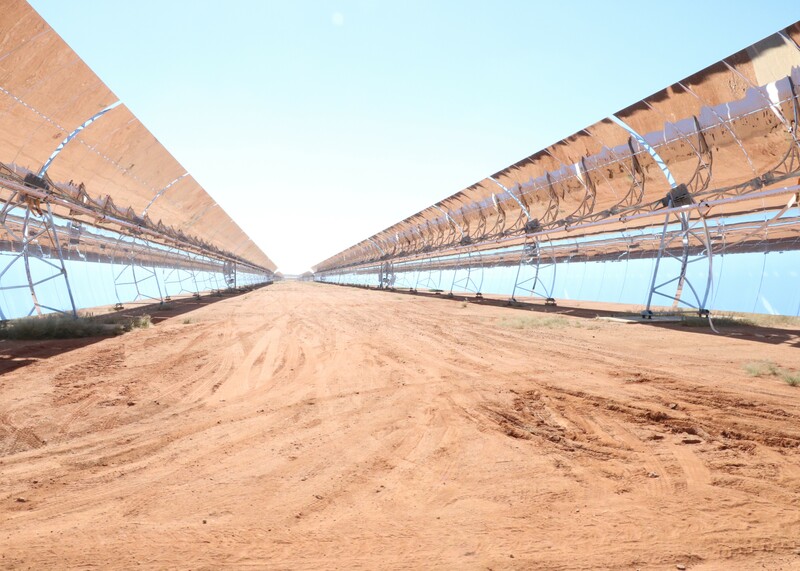 The Ilanga-1 Concentrate Solar Project (CSP) consists of the erection of a solar thermoelectric generation Power Plant, by means of a 100 MWe water steam cycle, which will be used as a primary energy source. 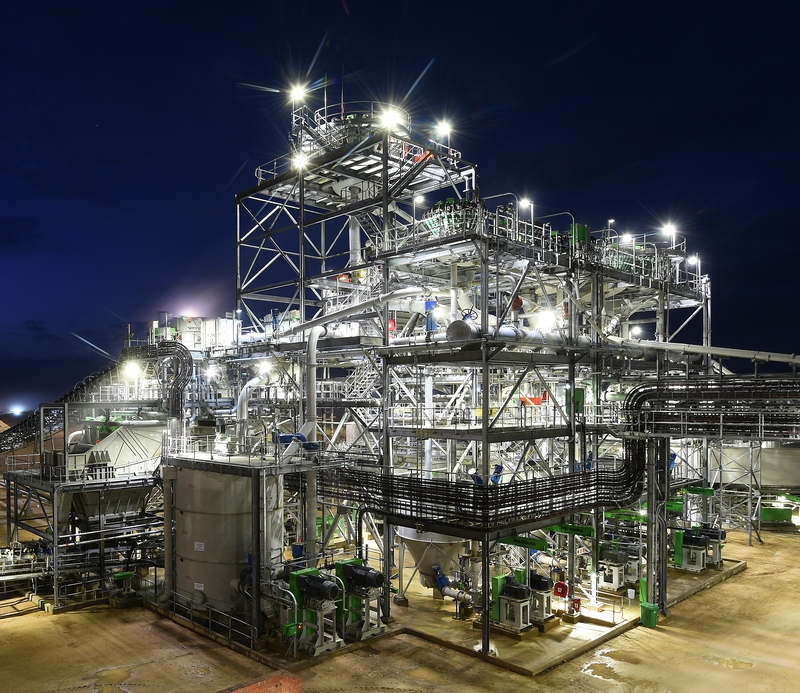 The plant includes a thermal storage system by means of molten salts which permits extended operation and electrical power generation during low irradiation conditions and after sunset. Besamandla’s scope was for the execution of trenches at the solar field and the pulling and laying of cables. Besamandla was contracted to do 30 km excavating of trenches and 220 km of pulling and laying cables. All electrical cables and I&C cables were free issued and supplied by Dankocom. Grounding material was free issued and supplied by Dankocom. Two variation orders were then added onto our initial scope of work: the installation of 502 local control panels (LOC) and the installation of 502 LOC cables trays and 30 SFDP cable trays. As this was the first CSP the company has worked on, it was challenging as the installation was complex and had tight deadlines. The client is a first world international consortium with the highest quality standards, which demanded an ISO:9001 system on site. This project was paperwork-driven and required our records to always be updated and submission of procedures for all installations needed to be done on site. The client had very high demands that needed to be met. The language barrier did not make this project easy; the Spanish had their way of operating and we had our way and this required us to adjust to the European work ethic. SANBI Hantam main plant is a 26,5 kWp solar PV plant constructed using 84 Jinko 315 W polycrystalline PV solar modules with one string inverter connecting 84 modules and total system rating of 25 kWac. This system was installed as an off-grid system and energy produced by solar farm is used to charge a 220 kWh battery system, which feeds the consumer. A total of 12 batteries were procured and imported. Provision was made for a change-over switch that when battery capacity drops to below 50%, the consumer is disconnected from the battery system and put back on the grid. Once batteries have charged back to 75% consumers are switched back to battery system. At the gatehouse, a rooftop system consisting of eight Jinko 315 W polycrystalline PV solar modules, a 5 000 W single-phase inverter and 22 kWh battery system was installed. Only two technical parameters were a pre-requisite for bid compliance, being an off-grid system with the ability to run continuously on batteries for 72 hours and not to export any surplus energy back into the grid. The system has been operational for the past six months and is fully off the grid. 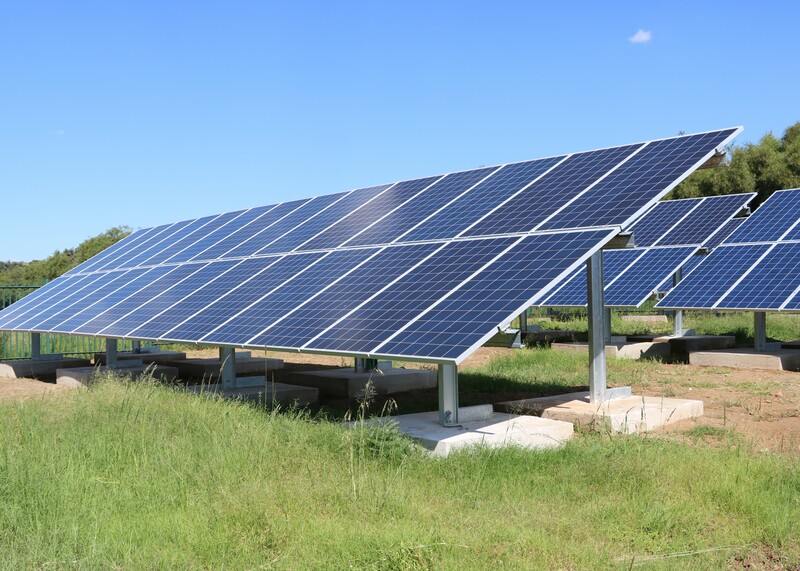 Besamandla’s scope of works was to undertake the full engineering, procurement and construction of the PV Plant. Electrical scope included the supply and installation of the PV modules, DC stringing to inverters, AC interconnection cabling, and the supply and installation of suitable distribution boards, and battery systems. Hantam receives a 400 V supply from Eskom. A weather station, metering system and information system were also installed. A battery container was procured, and the installation of the batteries and all electrical work was done by Besamandla in Cape Town. Once the installation was completed, the container was transported to site and commissioned. Project overview: Complete MV, LV and SCADA network. Bedhead ducting, theatre lights and pendants installation. Supply and installation of new cable trays and trunking throughout the hospital. Supply and installation 79 distribution boards. Supply and installation of a total of about 11 500 light fittings. 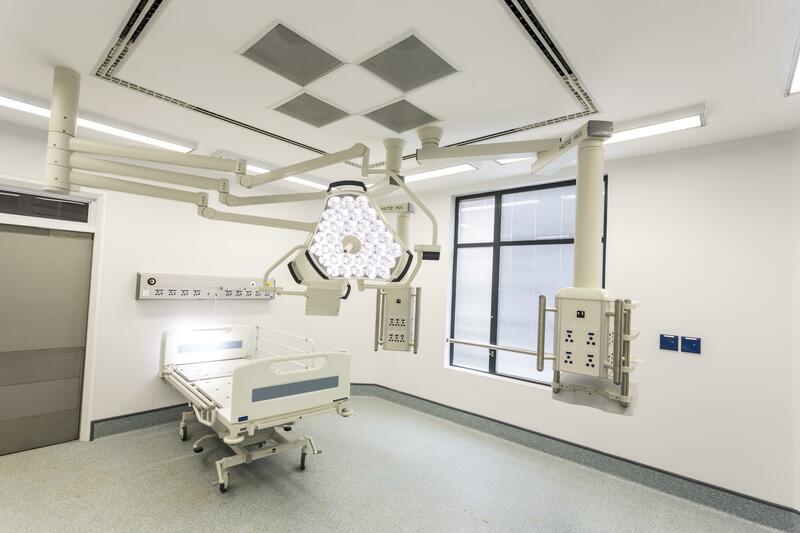 Small power to theatres, wards, ICUs, and HVAC equipment. Supply and installation of MV cables from the main substation situated about 1 km away to the hospital substation. The supply and installation of all 29 800 m of LV cables to LV distribution boards and street lights. The supply and installation of a SCADA system which was installed by a specialist subcontractor. Supply and installation of bedhead ducting, theatre lights and pendants. Supply and install two 1 250 kVa generators controlled via three PLCs situated in three different substations. Generators to generate 11 kV supply via two step-up transformers and 11 kV switchgear to be controlled with PLCs for switching purposes. Supply and install two 300 Kva UPS units. Supply and install 9 x 6 kVa UPS units in theatres and critical areas. Supply and install two 2 500 kVA dry-type transformers and 1 x 315 kVA oil transformer. The supply and installation of 11 500m of cable trays and trunking to facilitate all services, electrical, data and fire detection. A package for the small power to blocks D, K and E1. A package for the small power to blocks A, B, H1, E2 and F2. A package for all the excavations for the new MV cable route as well as the installation of the cable. A package for the installation of all cable trays and wire ways.